The RVCA produces individual reports for ten catchments in the Middle Rideau subwatershed. Using data collected and analysed by the RVCA through its watershed monitoring and land cover classification programs, surface water quality conditions are reported for Hutton Creek along with a summary of environmental conditions for the surrounding countryside every six years. 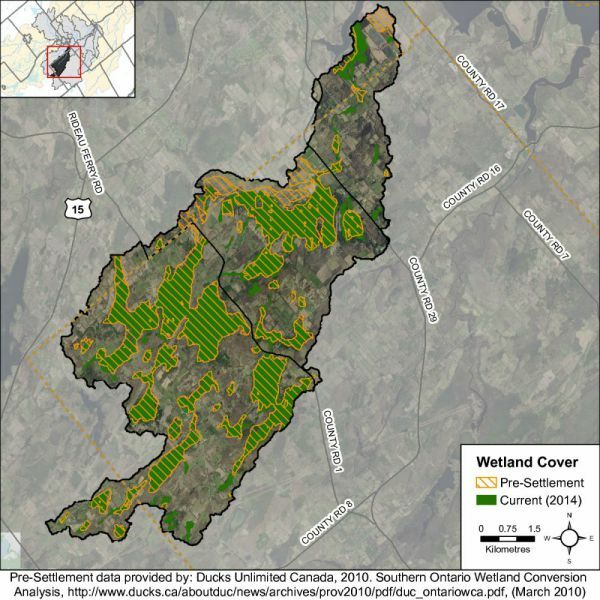 Surface water quality conditions in the Hutton Creek catchment are monitored by the Rideau Valley Conservation Authority’s (RVCA) Baseline Water Quality Monitoring Program. The Baseline Water Quality Program focuses on streams; data is collected for 22 parameters including nutrients (total phosphorus, total Kjeldahl nitrogen and ammonia), E. coli, metals (like aluminum and copper) and additional chemical/physical parameters (such as alkalinity, chlorides, pH and total suspended solids). Figure 1 shows the location of the monitoring site in the catchment. The water quality rating for the Hutton Creek catchment is “Fair” (Table 1) as determined by the Canadian Council of Ministers of the Environment (CCME) Water Quality Index and is largely influenced by high nutrient concentrations, metals and high bacterial counts. A "Fair" rating indicates that water quality is usually protected but is occasionally threatened or impaired; conditions sometimes depart from natural or desirable levels. Each parameter is evaluated against established guidelines to determine water quality conditions. Those parameters that frequently exceed guidelines are presented below. 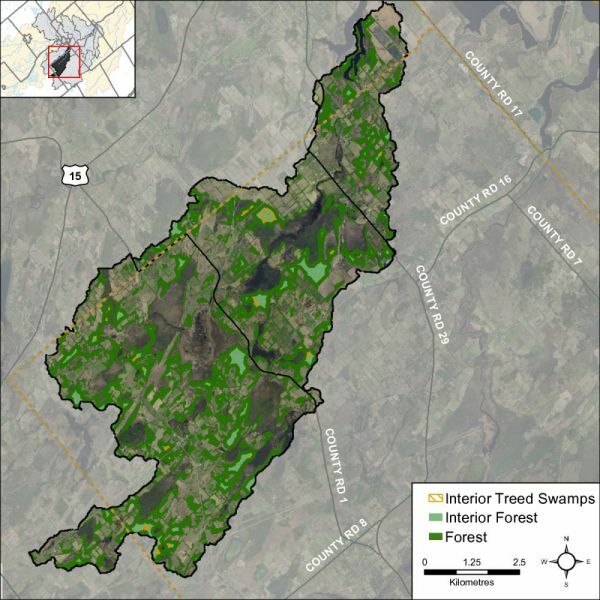 Analysis of the data has been broken into two periods; 2003 to 2008 and 2009 to 2014 for the stream monitoring site located on Hutton Creek (HUT-02) to examine if conditions have changed between these periods. Table 1 shows the overall rating for the monitored surface water quality site within the Hutton Creek catchment and Table 2 outlines the Water Quality Index (WQI) scores and their corresponding ratings. Total Kjeldahl nitrogen (TKN) and ammonia (NH3) are used as secondary indicators of nutrient loadings. RVCA uses a guideline of 0.500 mg/l to assess TKN and the PWQO of 0.020 mg/l to assess NH3 concentrations in Hutton Creek. Elevated TP results were a regular occurrence at site HUT-02; 45 percent of samples were below the guideline in the 2003-2008 period (Figure 2); this increased to 65 percent of samples in the 2009-2014 period (Figure 3). The average TP concentration increased slightly from 0.035 mg/l (2003- 2008) to 0.037 mg/l (2009-2014). The bulk of TKN results have exceeded the guideline (Figure 4 and 5), with 15 percent of samples below the guideline in the 2003-2008 period and only 5 percent of samples below the guideline from 2009-2014. The average concentration increased from 0.846 mg/l in 2003-2008 to 0.901 in 2009-2014 mg/l (Table 4). NH3 results occasionally exceeded the RVCA guideline. The proportion of results that were below the guideline were 67 percent in 2003-2008 (Figure 6); this increased to 83 percent in the 2009-2014 reporting periods (Figure 7). The average NH3 concentration decreased from 0.025 mg/l to 0.008 mg/l (Table 5). The data shows that nutrient enrichment is a feature of Hutton Creek. Average nutrient concentrations with the exception of Ammonia all slightly increased over the two reporting periods. Elevated nutrients may result in nutrient loading downstream. High nutrient concentrations can help stimulate the growth of algae blooms and other aquatic vegetation in a waterbody and deplete oxygen levels as the vegetation dies off. Best management practices such as an enhanced shoreline buffer, preventing the use of fertilizers and restricting cattle access can help to reduce nutrient enrichment in Hutton Creek. Table 6 summarizes the geometric mean for the monitored site on Hutton Creek and shows the proportion of samples that meet the E. coli guideline of 100 CFU/100 ml. The results of the geometric mean with respect to the guideline for the two periods, 2003-2008 and 2009- 2014, are shown in Figures 8 and 9 respectively. E. coli counts at site HUT-02 indicate a slight improvement with regard to bacterial contamination. The proportion of samples below the guideline increased from 40 percent (Figure 8) to 42 percent (Figure 9). The count at the geometric mean decreased from 136 CFU/100ml in 2003-2008 to 121 CFU/100ml (Table 6). Although the count at the geometric mean decreased, the results exceeded the guideline for both reporting periods. 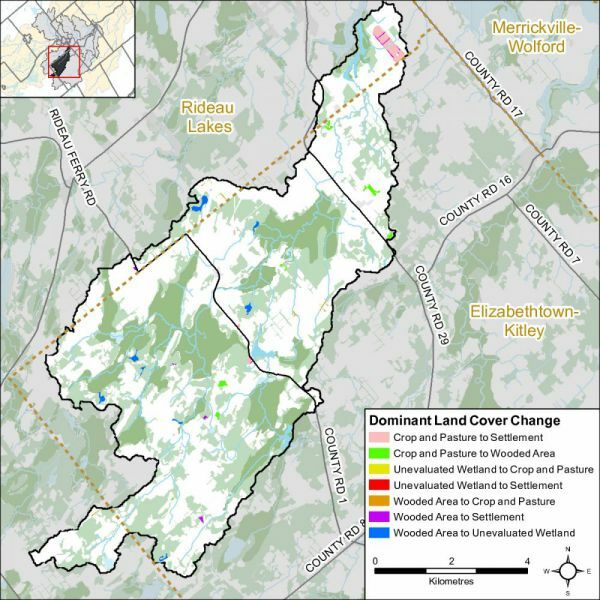 This data shows that bacterial contamination is a concern on Hutton Creek. There has been a slight improvement from the 2003-2008 to the 2009-2014 monitoring period, however the count at the geometric mean is above the PWQO for both monitoring periods. Properly maintaining septic systems, enhancing shoreline buffers and restricting cattle access can help to improve E.coli levels in Hutton Creek. Of the metals routinely monitored in Hutton Creek, aluminum (Al) and iron (Fe) occasionally reported concentrations above their respective PWQOs. In elevated concentrations, these metals can have toxic effects on sensitive aquatic species. Tables 7and 8 summarize metal concentrations at site HUT-02 and show the proportion of samples that meet guidelines. Figures 10 to 13 show metal concentrations with respect to the guidelines for the two periods of interest, 2003–2008 and 2009–2014. For Al, the PWQO is 0.075 mg/l and Fe it is 0.300 mg/l. Results from HUT-02 shows that Al concentrations had few exceedances with 84 percent of samples below the guideline in the 2003-2008 period (Figure 10). This improved to 100 percent of samples in the 2009-2014 period (Figure 11). The average concentrations for both reporting periods were below the guideline. Aluminum results from 2003-2008 were 0.076 mg/l and from 2009-2014 the average concentration improved to 0.013 mg/l (Table 7). Iron concentrations only exceeded the PWQO guideline occassioanly during the monitoring periods. The proportion of samples below the guideline increased from 80 percent to 96 percent (Figures 12 and 13). Although there were observed exceedances, the average Fe concentration did not exceed the guideline in both monitoring periods; 0.271 mg/l in 2003-2008 and .080 mg/l in 2009-2014.